There is no Olympic event for maximum sit-ups or crunches. But we are all obsessed with sit-ups or core exercises. Fitness freaks do endless core routines for that 6-pack holy grail. I wish someone would tell them they can’t spot reduce. And to stop eating crap. All I care about is #3. At least for now. Maybe when I’m old and gray I’ll worry about #2. And I’m not in a position to clinically diagnose back problems to safely help those in #1. Maybe Randy Bauer or Rob Panariello can. 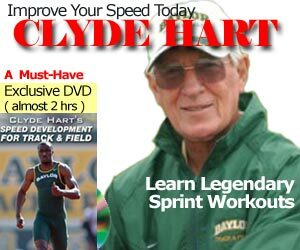 I believe you need to have SOME core work that covers all the angles and rotations in that occur sprinting. That being said, they are stabilizers! You have camps like myself, Charlie Francis and Sanya Richards-Ross who believe in high volume, low intensity core routines. I normally do 500 reps about 4 times a week on the EASY days. That’s easy when you consider I break it down to sets of 50, so it’s really 10 x 50 reps. Sometimes when I do 20 x 100m tempo runs on easy days, I add 10-20 core exercises at the end of each 100m run. Do the math and 20 x 20 = 400. So I do another 600 or 20 different sets of 30 reps (or 12×50 = 600) afterwards of other exercises. This includes med ball toss and other core exercises of low to medium intensity. I do NOT do crunches with 2×45 lb. plates behind my head. Those guys in the Gym freak me out. And I try to finish with a plank and side plank. So 1000 isn’t really that much, is it? I think the term sit-ups and crunches are really a misnomer, as journalists are not aware of the proper lingo. I like to use the terms “core muscles” or “trunk muscles”. For the sake of simplicity, I’ll leave out hip flexors in this discussion. Especially when you read how Lee Evans only did 30 pushups and 30 V-ups (straight leg sit-ups) PER DAY leading up to Mexico’s 43.86! When I give personal training advice to a friend on how to strengthen the abs and core, I usually start with my classic 2-pause-4 workouts. I didn’t invent this, as I learned this technique from my early days at my Pre-GymTech Nautilus Plus days in Montreal. It goes like this: Lie on your back on the ground using a mat. Bend knees 90 degrees. Place hands on thighs. Now go up and EXHALE in a two-count (2 seconds) until your hands reach your knees. Pause 1 SECOND. Then EXHALE and return back to the original position on a four-count (4 seconds). The last thing I want is to further damage a lower back problem, if you have them. This should strengthen weak abs, and along with hamstring and lower back stretches & mobility exercises, your lower back pains will be reduced, if not eliminated. 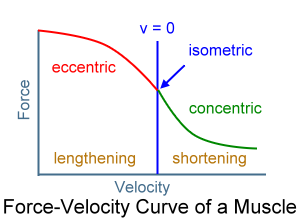 The above example is a combination of concentric (2 sec), isometric (1 sec) , and eccentric (4 sec) exercise. There are people I know who gave up their $1000 Aeron Chair by Herman Miller for a swiss ball at the office. Some people like my Aussie-Canadian friend Yaro have given up the chair completely and use a standing desk… table top at belly-button height. Of course, these people with the swiss ball could be the same folks who are jacked up on caffeine and eating processed carbs all the time in an office. As Charlie Francis would say, it’s okay to do bench press, and it’s okay to do swiss ball exercises, but please do NOT do two things at once! So why do we keep seeing these shortcuts in the gym? To save time? Mike Boyle, can you answer that? The bottom line is if you have access to swiss balls, and you enjoy doing swiss ball exercises, then go ahead. Same goes with any balance board contraption like the bosu ball. Just keep the range of motion at a functional level. No need to train the muscles where no muscle has gone before. 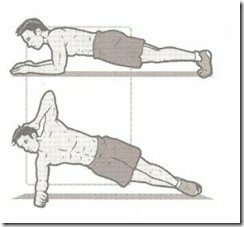 One of the best isometric exercise is as follows. I do a single 90 second hold for the plank, and 60 seconds each for the side plank. Total time: 3.5 minutes. The average person can’t do the plank for 60 seconds! So don’t settle for average! If you need a challenge to make this tougher, you can go longer in duration, or put your feet or legs on a Swiss Physio Ball or a Bosu ball. There’s been a lot of discussion from various forums from a guy named Barry Ross (famous for being Allyson Felix’s high school strength coach for teaching her the Dead Lift). I never met him, and I’m sure he’s a nice guy but the point I’m trying to make is to discuss his claim for using isometrics as THE BEST exercise. I’m not disputing his claims or trying to trash his methods.. that’s not my point. I just want to dissect the isometric part for abs. The mid-torso muscles are stabilizers with the primary function of maximizing trunk stability. Isometric or slow isotonic training in a range of non-specific and sprinting specific body positions offers a much better workout for the mid-torso musculature. The aim is 3 sets x 5 reps for 5 seconds, with a goal of 5 x 5 x 12 sec. He recommends 2 exercises, the “ab-45: and “ob-45”… you can guess the workout intelligently by the name ab and obliques at 45 degrees. Do the math, and you’re looking at a total time of 1.5 to 5 minutes! My biggest problem with isometrics is that they only strengthen one particular position. You need strength throughout the entire range of movement. By the way, Isometrics for Abs are great for boxers or UFC-MMA fighters athletes for taking a punch in the abs. So the question is: How much ab work is enough for someone who trains 30 hours a week? In 10 different events with different functional movements? Click here for the video, or click below. As you can see, core training can be an entire book or dedicated Blog. Just remember what your main goal is. If it’s running fast, then the best exercise is running on the track! I’m not a big fan of the two isometrics that Barry suggests, but I was shown (by my chiropractor) one isometric oblique hold that I like. 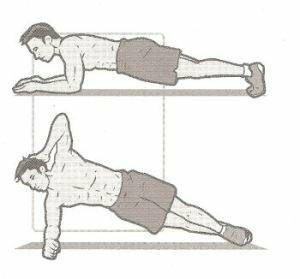 As you said, isometrics only strengthen a very small range of motion, but I’m not sure that’s bad if that range of motion is a square hip/shoulder position (front and side planks are isometric, after all — and we both like those). @sprint42, yes, I think some isometrics are good for sprinters, but not go overboard on the volume. So I guess you can do that exercise while sitting on a swiss ball, too. Do you have a video link for your “2-pause-4 workouts”? Also, do you have any recommended exercises or stretches for a bad lower back? I have trouble running more than 800m w/o my back completely tightening up and being extremely painful. Thanks, Jimson.